REGLabs is a small software company founded in 2004 in Tallinn, Estonia. Our main goal is to create high quality desktop products targeted mainly on Windows shareware and freeware market. We are mostly working on graphics and game related projects. The latest version of AGM Studio will be live-tested at the Tallinn University of Technology! Department of Computer Engineering students will use the studio for research and educational purposes during the following spring semester. Testing will mostly cover the Simulator, which was significantly improved, and the Flip-Flop Remover. The SSMIBDD Converter is still not hundred percent complete, but the release of stable version is scheduled for the early to mid spring. ...and lots more! Download now! Gorky-17 DAT Packer is finally ready and is available for download. Both the US and European format versions supported. Together with Gorky-17 DAT Extractor it makes a complete moding tool-set for Gorky-17/Odium game. DAT format is quite easy to understand so it is also a good choice for any demomaking project. Don't hesitate to send us your feedback or any suggestions you may have! Our partnership with Tallinn University of Technology Department of Computer Engineering (ati.ttu.ee) resulted in creation of AGM Studio. 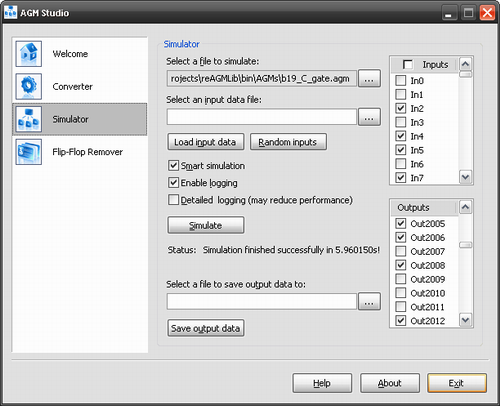 It is a powerful set of tools for fault simulation and manipulation with your AGM circuits. 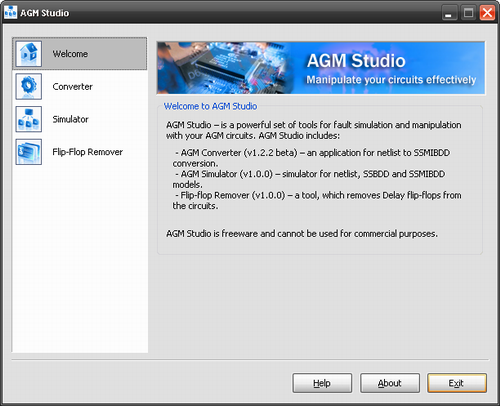 For now AGM Studio includes AGM Converter (used for netlist to SSMIBDD conversion), AGM Simulator (simulator for netlist, SSBDD and SSMIBDD models), and Flip-flop Remover (removes Delay flip-flops from the circuits). The final version of Gorky-17 DAT Extractor is being released and is available for download. This update combines both European and US file readers with automatic country detection, plus some cosmetic and functional fixes were also made. New major update for DVision is soon to be released. It will consist of some brand new features as well as updates, including Unicode file names support, thumbnail viewer, extended multithreading, improved memory management, new tools, new file formats support, and lots more. We also plan to make an interesting proposal to all our users, so stay tuned! To stay in touch with us you can follow us on Twitter. I started a side project to port REG Engine to Java platform. All details and current status can be found on the REGEJ page. Work on REG Engine itself and DVision also continues. Some serious improvements were made to the memory manager which greatly fasten most plug-in operations. • Totally redesigned 2D viewing system. It is now much faster and precise. We have got a new domain! REGLabs headquarter now resides on www.reglabs.eu. All e-mails including product and technical support have been changed to new ones. Refer to the Contact section for details. DVision is still holding the second place by popularity in 3D Modeling and CAD on cnet.de. Way to go!!! DVision 3 is now available for download on the famous CNET's Download.com site. This is a very pleasant fact for us! Software information, comments and feedback can be found here. Happy new year everyone! We would like to thank you all for your feedback! Work on DVision continues and some critical updates have already been made according to your response (this includes absolutely new 2D viewing system, new file formats support, 2D editing tools, better file handling, some bug fixes, and more). DVision is now also available for download on the CNET's VersionTracker. So if you would like you can leave any feedback here.